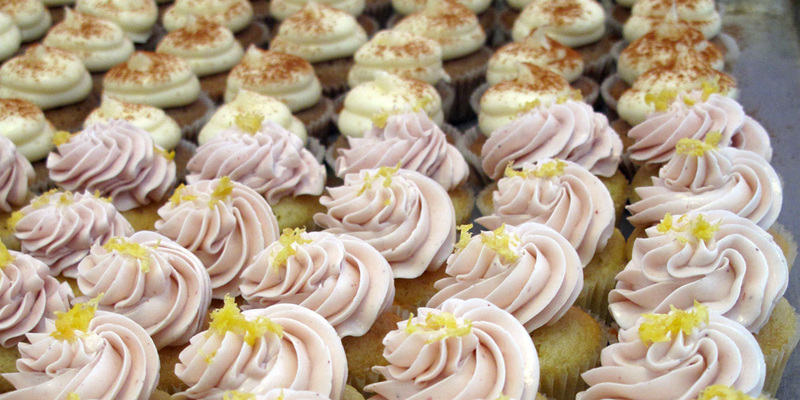 Mission Minis’ store on 22nd Street highlights owner Brandon Arnovick’s culinary creations – tiny cupcakes whose ingredients, like Aztec chocolate, take cues from the neighborhood’s distinct flavor. After he opened the storefront in January, he wanted more customers to savor his confections. So the bakery founder tried a new style of promotion to lure more customers. On March 30th, when thousands of Bay Area residents checked their e-mail, they found a coupon for two-dozen miniature cupcakes for $11, half the usual price. To get the deal, at least 100 people had to commit to buy. By day’s end, more than 3,000 did. The deal came from Groupon Inc. a Chicago-based company now in 50 U.S. cities. (The name “Groupon” combines group and coupon.) Collective bargaining sites like Groupon use drastic discounts to entice customers to try something new, and these sites are thriving in the Bay Area. At Mission Minis, Arnovick and his staff got more than they bargained for, and they had to hustle to keep their new customers happy. Groupon sales suddenly made up 65-80% of their business, manager Liz Germain estimates, and the surge didn’t calm down for a couple of weeks. The bakers had to go shopping twice a day to replenish milk, oil and butter. Overwhelmed by demand, three people threatened to quit. There’s now a dedicated section of Mission Minis’ web site that answers Groupon customers’ common questions. On a recent Saturday, every other customer seemed to redeem a Groupon. By 1 o’clock, 36 certificates had been cashed in for nearly 900 cupcakes. Agatha Okuda redeemed one of the coupons. She grew up in San Francisco and misses it. Okuda and her family now live in Fairfield, and they buy Groupons in batches. “There’s not much to do in Fairfield, so we drive out here and do San Francisco stuff,” she said. With Groupons in hand, Okuda said the discounts decided their route: their next stops would be Philz Coffee and the San Francisco Soup Company. Another customer had missed the deal for Mission Minis, but said Groupons determined where he went on dates. Launched in 2008, Groupon recently received a $135 million investment led by Digital Sky Technologies, the Russian investment group that also has stakes in Facebook and Zynga Game Network Inc. Groupon said in a press release that it will use the funding to fuel expansion, with plans to double its operations to 100 cities by the end of the year. Groupon declined to be interviewed for this article. The collective bargaining craze has spawned a host of rival contenders. They’re popping up all around the country, and some of those that operate in San Francisco include Specialdeals.com, Savvy Avenue, SocialBuy, FreshGuide, BloomSpot, LivingSocial and Groop Swoop LLC. Groop Swoop is based in Emeryville, and it offers deals in both San Francisco and the East Bay. It launched in October 2009. Co-founder Eileen Conway said that the market is so saturated that “the minute we run a deal with a business in San Francisco, those businesses are getting calls even that day” from Groop Swoop’s competitors. Conway said Groop Swoop cultivates relationships with businesses bringing in only as many customers as a client can handle. Thomas Peña is one business owner who likes Groop Swoop’s smaller, personalized approach. He has run four promotions with Groop Swoop since November. Peña owns Regalito Rosticeria, a small Mexican restaurant at 18th and Valencia. 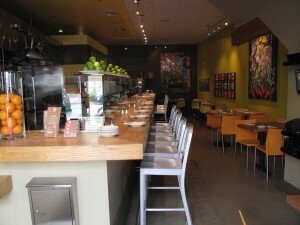 The three-and-a-half-year-old restaurant has an open kitchen and brightly colored walls hung with folk art. Each Regalito promotion has sold approximately 50 coupons. Peña likes the collective buying model because he knows the money he spends with Groop Swoop brings in customers. With other kinds of advertisements or promotions, he was never sure if they worked. Thanks to collective buying, “We’ve got lots of new customers coming in, so we’re happy,” Peña said. With Groop Swoop, customers could get $25 of Regalito’s food for $10. “We cover what it costs for food, [but] it doesn’t cover the cost of washing the dishes – anything else,” he said. Peña has looked at other collective buying companies, but said those businesses take a higher cut than Groop Swoop. If he went with them, he said he wouldn’t break even; he’d lose money. Back at Mission Minis, Groupon-clutching customers are still coming in steadily, but the pace is more manageable for Arnovick and his staff. The employees who threatened to quit changed their minds. His manager estimated that these days, coupons make up 15-20% of sales. In the hectic rush to redeem, some customers posted cranky Yelp write-ups about botched orders, but there were also rave reviews. Arnovick says the promotion has netted him repeat customers willing to pay full price – $11 per dozen. Asked if he would do it again, Arnovick said definitely… but not until next year, when the first batch of Groupons expires. Note: In the earlier version, we erred in spelling Groop Swoop, Group Swoop. We regret the error. Nothing like members of a staff that want to quit because they are too busy. What a joke. The workers should form a union! Forget forming a union! The workers should use Groupon to buy onions in bulk, and then sell them to the bakery owner for double the price. Workers who threaten to quit because they ran a promo. I’m soooo sorry that the popularity is creating repeat customers and job security. Sounds like it is time to fire the workers and get some who…well…work. I believe in supporting businesses that actually build relationships and understand the needs of the small businesses they work with. Large companies tend to just see dollar signs and don’t take the time to consider what’s actually feasible for a smaller business to produce. Group buying sites like myjoffer.com put a minimum and a maximum amount of vouchers needed to sell based on what that company can actually achieve without losing money. There have been many times where I’ve seen a deal of theirs sell out quickly because of this, but it’s a way to ensure that they’re not overloading our local SF businesses like a lot of the other sites out there. Why didn’t they put a limit on how many groupons could be sold? It doesn’t have to be unlimited. groupon determines where you take your dates? what a catch!! put a limit on the time of day or types of orders – say X coupons redeemable May 1-15, or you have to pre-order 24 hours in advance (in person and hand over your printed out Groupon). If I remember right, they did put a limit because I tried to buy one around 8pm but couldn’t because they’d reached the limit. I like the philosophy of GroopSwoop, which is a Bay Area local and supports local businesses, rather than an out of state business focussed on their own bottom line. Kiki its pretty obvious that you work for Joffer…kinda uncool to pretend your not shamelessly self promoting. You guys shouldn’t be so rude to them. They are a growing business and like all other business there is bumpy roads. I’m sure they will pick up perfectly in a while and be a huge success in a while. This article doesn’t really make the Mission Minis situation clear to the public. We only had a staff of five employees at the time, and very limited baking resources since we just opened a few months ago. We bake everything from scratch every day, by hand. We were not ready for the overwhelming response we received from the offer, and Groupon did not provide us adequate information about the popularity and huge outcome we should expect to receive. We have done similar deals with other organizations in the past, and none of them were this crazy. Groupon should have done a lot better job in explaining their popularity, along with potential ways to put a cap on the deal. We were really caught off guard because of the lack of information provided. Employees only wanted to quit after having to work literally 15 hour days minimum, sometimes even having to sleep upstairs on the floor just to be able to fill orders flooding in from angry customers trying to squeeze in “just two more dozen.” And the Groupon deal launched a few days before Easter weekend, so you can imagine the influx of customers was out of control. One employee even stayed up for 52 hours straight having to bake, box and respond to orders, then received a $300 traffic ticket on their drive home from being so exhausted. Here’s a better breakdown of the severity of the situation if it is still unclear. The small staff of five at the time included three front counter people. That means that over 6,000 DOZEN, or 72,000 individual mini cupcakes, had to be handmade from scratch by two people. Two people! And that was JUST from Groupon and did not include our full-priced or standing orders. Tack on an additional 50 dozen per day (and up to 125 dozen on weekends), and you can start to understand why an employee might want to give up. If I didn’t know any better, I’d laugh too and say “Wow, it’s just cupcakes, it’s not hard.” I really wish people knew the whole story and were a bit more considerate of the hardworking staff that have been picking up the pieces of a mistake rooted in poor planning and a severe lack of information caused by Groupon’s inefficiencies.